Rafael Nadal locked up No. 1 on Wednesday in Paris, but today had to withdraw from the event ahead of his quarterfinal match against Filip Krajinovic. “The way that I am today I do not see myself playing three more matches,” Nadal said. “The knee is always bothering a little bit but sometimes it’s worse. Nadal, who beat Pablo Cuevas in three sets Thursday, is 18-1 since the start of the US Open. He has never won Paris nor has he ever won the ATP Finals. “For me it’s not about London it’s about longer term,” Nadal said. “I cannot talk about London now,” he added. “I am now sad to pull out from here. I feel at home here so for me it’a very tough day. If Nadal skips WTF, Fed will regret not playing Paris. If he wins WTF undefeated, as he will be heavy favorite to, he will be 10.505 pts to Nadal’s 10.645 pts, fall short just 140 pts. QF in Paris and it would have done. Daniel @10.25 am. My thoughts exactly. Feddy Boy must be kicking himself! Nadal pulled out of Paris after getting the needed win exactlz because Federer was not in the tournament. It sounds like Nadal’s knee has been bothering him before yesterday. Had Federer come to Paris, Nadal wouldn’t have pulled out, for sure. In any scenario, he would be able to win needed amount of ranking points (Paris + London) to assume year-end #1. This is what Federer knows too well, and in that sense his decision is very good. He would just have risked too much and jeopardized his London outlook. Now, heading to London, Federer stands out as the top favorite, and a clear favorite over Nadal in their potential match in WTF. He will have his changes next year to come (back) to #1, but I don’t think it is his ultimate goal. Good decision, rest Rafa. See you in Australia! WTF in theory is a cool event but reality is it’s all about the Slams and end of the year is the only time players have to rest. Hopefully this is just precautionary. Looks like DelPo is a break down to Isner in the 3rd. Hopefully he can get it back and win here. Would rather see him in the WTF than Isner or PCB. Smart move by Rafa. He got his #1. Hope he feels well enough to play WTF, would love to see #5 beatdown. @Daniel – I think if Fed really cared about #1, he would skipped Basel and played Paris instead. Skeezer. Your words are so classy! NOT! What is the scenario now for London with the ball basher losing? Anyone know? Right now PCB still got the last sport. If neither Inner nor Sock wins the title he qualifies and finishes the year top 10. If Isner wins the title (which he has a high chance now, virtually in the final) he will qualify on top of PCB and DelPo. PCB will be first replacement and DelPo Second. If Nadal doesn’t play PCB will get in and DelPo not. So DelPo needs Isner not to win the title and Nadal to withdraw, than he gets in. If Sock wins the title, he qualifies even if Isner reaches finals, so he will punch PCB out and DelPo second replacement. Right now DelPo finishes the year in top 10, but only if neither inner nor Sock wins the title. If Isner and Sock make an all american final, the winner qualifies for London and finish the year top 10. A lot at stake for both. To me ISner is in finals and Sock has a good chance against Verdasco and than winner of Cilic x Benneteau. Cilic should capitalize now, on paper he is the heavy favorite for another Masters Title. RZ: Roger had and has a contract with Basle (or Basel whichever sp. U like) – no way would he skip. Agree with Daniel – Likely winner is now Cilic….but excitement left when Rafa left – alas. Ole skeezer is smacking his lips in anticipation of the ole won lifting the wtf trophy. The ATP calendar has to be looked at very closely and rejiggedThey play the whole year and the last tourney. not counting the WTF. is aMasters 1000? Wtf? By this time the players are tired and a lot of them injured, some disinterested, others just want to go on holiday. Poor guys. Indeed J_K, without Nadal, DelPo and Grigor, tourney lost all star power. I mean Isnerv vs Qualy semis noone wants to watch. Nadal shouldnt have played so many events after us open !! For all those commenting on federer cherry picking events just wait till nadal has to do same as he’s older and body can’t take it. Doubt be nadal fans comment when he’s forced to cherry pick events. For a player who has never won a world tour finals trophy nadal should have priorities not play so many uninspired events ! Lol. Mr Rivkin. As long as the WTF is on indoor HC fast surface. Rafa has absolutely no chance of winning. Would really like to know what the atp have against rotating the surface for example once every 2 year’s. Giles – WTF top ranking points is 1,500. Congrats to the lovely Caroline Woz and her engagement to NBA player David Lee – wonderful pics. on them….so “up yours” shrimp Rory…such a brave guy – cancels the wedding by email!!!!!!!!! J-K. I know what the wtf max ranking points are. So….? @Giles: your Twitter link merely shows that Federer suggested they speed up the courts and that Forget said that they would consider it, not that they did it. No harm in asking. Just like no harm in certain other players asking for slower balls to be used so that players have more time to set up their shots. Doesn’t mean it’s going to happen. Giles: My apology – too much speed reading – I thought you were asking!! !…..and my beautiful bit of fresh cod was cooking..
That was Nole’s therapy ordered by doctors to avoid surgery, not to touch the racquet for minimum 3 months, methinks. Cilic out, bizarre day, all the favorites dropping. At least the crowd will having something to cheer for as Benneteau is in semis and being Verdasco or Sock is very doable to reach a final at home. ^^^ one more thing, reading what Agassi said just day or two ago and how he is confident in Nole and his retutn it must be that injury recovery process was successful. Nole is only playing Abu Dhabi before AO, he is not playing Brisbane. After Abu Dhabi they will be together in Australia where Agassi is playing in Adelaide. AO starts on 15th of January. Wog Boy: Sounds a helluvah precaution. Presumably it is now disappearing into the mist?. Re: current contest – gets worse by the minute. The only other option was surgery. Benneteau has never won title, can you imagine scenario in which he wins masters at the end of his career without winning any other title? I can’t. WB: On second thoughts could be a useful “go-to” reflex – prepare to return with 2-hands – release and voila – a left hand return – surprise, surprise – point won!!! Ah well, looking forward to 2018. When the fate of a nation is at stake, it’s serious business. That link is from a Djokerite. Figures. And a Rafaphile scoured the twitdom to find it. Figures again. Nadal has lobbied for moving the WTF to clay – the WTF! Clay is a bit extreme, but I think that rotating the surfaces could make things very interesting. Does anyone remember (showing my age here) that the ’74 Masters was on grass? And the crazy thing is that it was won by…get ready for it…Vilas! At any rate, a good compromise could be the slow indoor carpet that was used in 2000 (I think) where Kuerten came out on top. At this point, asking the top guys to play on grass or clay right after the Fall indoor season would be a bit absurd. Yes and having a Grass seaaon as long as Clay would only be fair right? I think grass season should be prolonged. Grass adds altogether a different dimension to this beautiful game. WTF should be rotated to outdoor hard now as it’s been indoors for quiet a bit. More grass isn’t going to happen. It’s too expensive to maintain and tennis is all about MONEY, MONEY, MONEY, these days. Skeezer, another excellent idea! The WTF could be held as an outdoor/indoor grass event at Singapore’s Padang hosted by one of its two rich clubs, the Singapore Cricket Club or Singapore Recreation Club (which both have grass courts at opposite ends of the Padang’s big field). 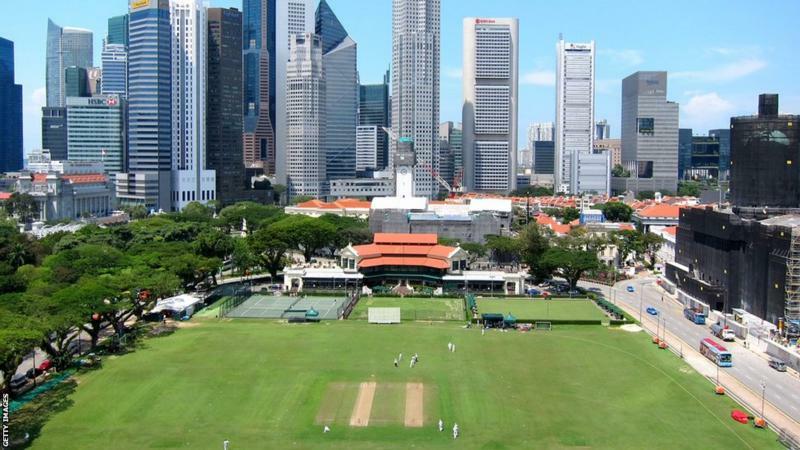 An annual tennis championship was started there in 1875 – predating the Wimbledon championships by two years – so there is a historical reason to hold the WTF on Singapore’s Padang! I’ve played on the SCC’s grass courts many years ago. It could also be held as an indoor event by constructing a bubble dome. Might be able to catch a game of soccer, rugby or cricket, or even F1 racing, before the session starts. The BBC considers the larger field one of the “world’s best cricket grounds”. The picture shows the end of the field with the Singapore Cricket Club. the Singapore Recreation Club (which also has grass tennis courts) is at the other end of the field. The 1974 Masters (now rebranded the ATP World Tour Finals) was held at Kooyong’s grass courts in Melbourne, Australia. Along the way, Guillermo Vilas beat — in straight sets — both Bjorn Borg and John Newcombe, two of Wimbledon’s top ten men’s champions of all time. In all, Vilas won 3 grass court titles as well as 6 indoor carpet titles and 1 indoor hard court title. The cult now wants all slams and Masters to be on grass because on clay Nadal is supreme and on hardcourts Djokovic is the best with Murray close behind. Thanks very much for that article, great read, great respect for Vilas and I learned few things that I didn’t know before. Wog-Boy: It was a response to Tony N – but available to anyone who was interested. Glad you liked it – Vilas comes across as a very likeable guy…..I wish I could complain about various situations with his humour. LOL who said this? Lies again…. Played on Grass also. What did you think of it?